Located at Denmark Hill in south London, this statue of Catherine Booth (1829-1890), co-founder of the Salvation Army, was apparently dedicated twice. The first dedication took place in 1929, the centenary of her birth, and the second the following year when an accompanying statue of her husband William Booth – they stand on either side of the entrance to the Salvation Army’s William Booth Memorial Training College, designed by Sir Giles Gilbert Scott (he also designed the statue plinths), on Champion Park – was also being dedicated. 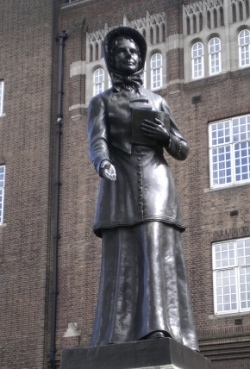 The work of George Edward Wade, the bronze statue depicts Booth in her Salvation Army uniform – complete with bonnet – and has her holding a Bible pressed to her heart and reaching out with an open hand. Her husband William is also shown in his uniform, preaching from an open the Bible. An inscription on the granite plinth below describes her “The Army Mother”. The larger than life statue was cast at the Morris Art Bronze Foundry. There are, incidentally, exact replicas of both statues in Mile End Road in London’s east. Donated by the women of the Salvation Army in the US, that of William was unveiled in 1979 and that of Catherine a later addition, unveiled in 2015 on the 150th anniversary of the creation of the Salvation Army. The statues are located close to the site where the Booths commenced the work of the Salvation Army in July, 1865.